My husband, like many people, had mono as a kid. Mononucleosis is actually most often caused by the Epstein-Barr Virus (or EBV) which is essentially a recurring virus that can remain latent in the body, or can reactive / flare up throughout one’s life. When EBV does reactivate for some people, the symptoms can be debilitating. Some of the symptoms include: exhaustion and fatigue (like chronic fatigue syndrome), swollen spleen and/or liver, brain fog, lack of appetite, swollen and sore glands, autoimmune problems, sinus infections, and more. With my hubby, it most often flares up when he’s sleep deprived and stressed out. It also seems to be a seasonal thing, reactivating when the weather changes in spring and fall. Well the weather has changed, and my poor hubby has been tired and his glands are swollen. That’s usually a sign for us to get on the offensive. So for anyone else out there struggling with this, I thought I would share some of the natural things we do to prevent his EBV from setting in, and when it does, how we prevent it from becoming a sinus infection or fatigue. Please note that these are just home remedies, and although some of these remedies are doctor recommended, others are more like trial and error items that we’ve found to be helpful. If you have EBV, you should talk to your doctor about your specific issues. Depending on your situation some medications may be helpful in preventing more serious side effects of Epstein-Barr. *Go to bed and wake up at a regular time. Routine helps people with EBV to get in to regular sleep patterns. Fatigue can lower the body’s immune defences and make it more susceptible to flare-ups. * Take time to exercise and relax. Both regular exercise and relaxation increase white blood cell count. White blood cells fight off infection, so maintaining a strong white blood cell count can help fight off EBV flare-ups. * A balanced diet with lots of fruit and vegetables. This helps boost the immune system. * Stress management. Easier said than done, right? My hubby is doing his PhD. Stress is a constant state of existence. But exercise, regular sleep patterns, meditation, and a balanced diet can all help manage stress. * Lots of fluids. The virus is essentially an infection that causes inflammation. Liquids, (particularly warm ones, given the painful swollen glands) can help sufferers stay hydrated and fighting off the virus. * Epstein-Barr Tea. Well that’s what I call it anyway. This is an antibacterial/anti-viral tea I concocted based around one I make for myself sometimes. As soon as hubby starts feeling like his glands are swollen, I make up a pot of this and he has a couple of cups. If we’re lucky, that alone will be enough to fend off the virus. The recipe is at the bottom of this post. * Sinus rinses when the sinuses get really stuffy. This is mostly if the virus has been active for a couple of days. The rinses seem to help drain the sinuses and prevent sinus infections. Netti pots or plastic sinus rinse bottles and the saline solution can be bought at most pharmacies for about $15-20. * Sleep and rest. Your body needs to fight off a virus. Let it. * Light exercise. Exercise can help boost white blood cell count, which can help fend off the virus. * Aspirin: can help reduce inflammation of the lymph nodes and reduce pain. The basic ingredients are all considered to be helpful in natural medicine. Some studies suggest that ginger has antibacterial properties, and can be helpful in combatting various forms of cancer and nausea as well as reducing arthritis symptoms. Cinnamon is a strong antioxidant and regulates blood sugar levels and some tests have even shown that the smell alone can boost brain function! Honey is considered by some to be immune building  as is lemon juice. Add the water, ginger, cinnamon, and lemon to a pot and bring to a boil. Remove from heat and pour into a cup, add honey. Mix until honey is dissolved. Repeat with remaining tea. Both cinnamon and ginger induce sweating, which is very good for detoxifying when you are sick, and is used in Traditional Chinese Medicine to warm up people who are “cool.” However, some people may have adverse reactions to too much ginger, so use in moderation until you are comfortable with it. 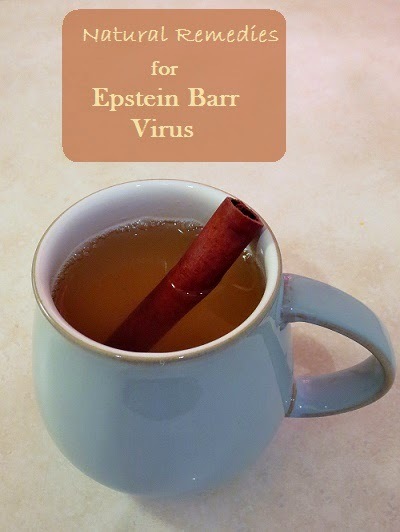 Please share your Epstein-Barr virus stories here! I'd love to hear how you manage it, or if you know someone with it! Omoya, F. O., and F. C. Akharaiyi. 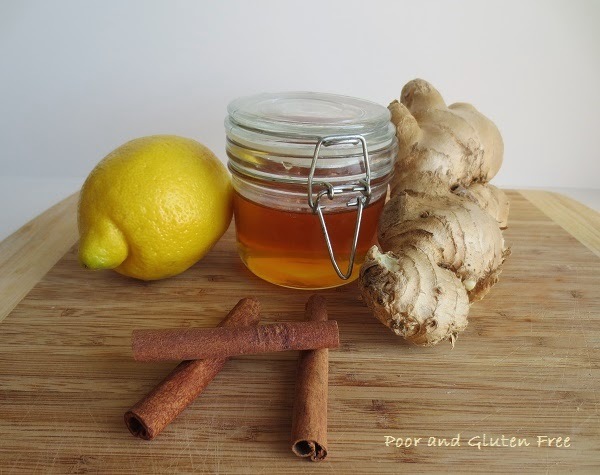 "Mixture of honey and ginger extract for antibacterial assessment on some clinical isolates." Int J Pharma l Biomed Res 2, no. 1 (2011): 39-47.
http://www.londoncss.co.uk/scientific-journals.co.uk/web_documents/1020517_honey_ginger_extract.pdf (This study used a combination of ginger and honey extract to examine their antibacterial properties. Please accept my apologies if you arrive on this page and there is spam in the commentary. This blog post in particular attracts a lot of spammers that profess cures for certain viruses. The commentators are spammers. I cannot tell you exactly what will happen if you click on their links or call the phone numbers they list, but I bet it's not good. Thank you for writing about this.....not something a lot of people are familiar with. I was diagnosed with re-occurring EBV. I now know that was just a part of what was wrong but it contributed to a lot of intolerable symptoms. I was just diagnosed with EBV. Still learning and figuring things out. This was encouraging and helpful! Thank you. You're welcome, Maureen, I'm so glad you found it helpful! I'd never heard of it until I met my husband, so it's been a learning curve for me / us, too. Please go to heritageessentialoils.com and order a bottle of Plague Defense. It will kill any virus in the body. It can be taken in an empty capsule or applied to the bottoms of the feet. I promise you that it will be worth every penny. Hi momma-lana, thank you for the suggestion, but chronic EBV is not a passing virus like a cold or flu. It is a virus that stays in the body for life, and so far there have been no proven, effective treatments for destroying the virus. As much as I like to advocate for natural therapies and remedies, unfortunately this one is not so simple. I was so interested to read your post, Danielle. Although I had heard of Epstein Barr virus I did not realise it was what caused Mononucleosis, nor that it could continue to affect one later in life. You've provided some really good information here for anyone who is a sufferer, and both your tea and chicken noodle soup sound very restorative - as well as delicious! Thank you for being a part of the Hearth and Soul hop. I'm having an EBV flare up right now. We just moved cross country and I am on the search for a doctor in our area that understands what I'm going through and knows how to keep tabs on it like my previous doctor. This post was so validating after having a doctor tell me today that mono is not a reoccurring thing. I've been making lemon and honey tea, I'll have to try your recipe, it sounds soothing. Hi Katie, I'm so sorry to hear that a doctor said that to you! Having multiple allergies I understand how disheartening it can be when a doctor makes you feel like you're imaging things, or that you're wrong when you know something is not right with your body. I hope you find one you can trust and who will support you. After many many years of no answers I was diagnosed with EBV in November. I am trying to manage it but boy when you have 3 VERY active kids it is not easy. My falre ups will last weeks sometimes. Right now I am on week 3. I am working on changing my diet but is there anything else that I can do in the short amount of time I have? So sorry to hear it's dragging on. Unfortunately I can't recommend a quick fix, but I do know that my husband feels better if he drinks lots of fluid (warm water, if your glands are swollen and sore, can be easier to swallow) and tries to rest as much as possible. If your nose is getting stuffed, steaming over hot water and sinus rinses might also help. And of course, trying to prevent a flare up in the first place with regular exercise and sleep patterns, meditation, and a balanced diet. Hope you feel better soon! You can also add whole cloves or ground to the steaming water. It has some antibacterial properties but it also reduces the pain of sore throat and helps sinuses to drain. Thank you. Finally diagnosed with this after suffering for five years. Debilitating at times. Coming off a cold, found this blog. Bought the ingredients and just made the tea. Drinking it now for the first time and it is so good! So glad you like the tea, and glad to hear you finally got a diagnosis. At least now you know what you're dealing with! Thank you for the recipe. Do you strain the tea before you drink it? Thanks! My husband usually just drinks it as is and works around the ginger slices, but you can strain it if you like! I found out thru a blood test at Center for New Medicine in Irvine, CA that I had EBV, it was very high. I had a series of UVLRX intravenous treatments with immune IV afterwards for 10 wks, one a week and am virtually free of the virus now. Interesting, thanks for sharing that. This isn't standard in Canada (and in fact I don't think they do it at all here). I believe it's still in the testing and research phase, correct? I don't know if my previous thanks reach you. Thank you so very much for answering me and foe the tea. I have been having it once a week and it seems to help. I had to have some blood test redone and I drank some the night before and not only were my electrolytes perfect my epv results were much better. Your are a miracle worker. Not too much luck with infectous disease doctor. Your help and explanations were better than his. Can I give my mother your recipe . She was on cortisone for 6 months for her arthritis and now is vey exhausted and has no energy. Again I thank you for being such a good listener and helper with the epv virus. What a difference you have made for me to know that there is someone who believes and understands what many of us are going thru with the virus. One question. How often can I have the tea. It might not be related but I was suffering from night sweats ( I know of a male epv sufferer who also has those ) and since having your tea they have diminished considerably. Thank you again. ps sent the recipe to my mom in France. She will talk to her dr. there. She was diagnosed with polymyalgia rheumatic. Hi, I'm sorry but I really can't say how often to have it, it's not exactly a prescription. I only make it for my husband to have a cup or two a day while he has a flare-up, so not longer than a couple of days in a row at any given time. Personally I find that too much ginger and cinnamon is a bit warming, and can induce sweating, so I wouldn't be drinking it all day long or anything like that. Going through an EBV re-activation flare now...just wrote a blog about it. I am a holistic health coach who suffers with this and other auto-immune issues. So tired of being sick and tired...lot of pain and left side feels tender, rash, etc etc. Penny(I follow you on Pinterest as well) had no idea about your husband. Aren't you confusing "anti bacterial" with "anti viral"? Epstein Barr is a viral infection, not a bacterial infection. I have EBV and CFS my tea recipe is very similar but I also add an equal amount of turmeric (as ginger) and a pinch of cayenne pepper (makes the turmeric more potent). It is great for reducing inflammation and pain as well as being antiviral. Master Tonic is also a great antibiotic (also called fire cider). I was diagnosed with EPV 3 or so years ago. I also have Chronic Fatigue,Fibromyalgia & Hypothyroidism along with Chronic pain all came from MVA's and after. My LabCorp report showed 600! But I was told there was no cure. And not given any type of suggestions except antivirals that didn't help. All of these have almost the same symptoms and it's hard to realize which is causing what! There are times I get a sore throat, swollen lymph nodes, very painful knots in shoulders, ears stopped up, etc out of nowhere. Like now...but it's allergy season and I have bad sinus problems. How do you possibly know if your having a EPV flare when you have all these crossover illnesses?